When somebody asks, "what key you sing in?" What do you say? The best response is a question of your own: What key do I sing WHAT in? The simple (no flourishes or vocal licks) melody line of "The Star Spangled Banner" melody uses a lot more vocal range than the simple melody of "Amazing Grace". The Star Spangled Banner uses 12 notes of the scale; Amazing Grace uses 8. Therefore, a singer would need to start the Star Spangled Banner a lot lower than Amazing Grace, so that the high notes are reachable. For instance, I would sing the national anthem in the key of "F", and I sing the hymn in "D". What is the total vocal range of the melody? Where would the lowest note hit? Where would the highest? Will you be playing with the melody? Are you going to embellish the melody stylistically, going higher and/or lower than the simple melody? Those notes must be taken into account. Where is your sweet spot of vocal range? If you have a large range, enabling you to sing the song in several different keys, you need to figure out what key will put you in your richest vocal resonance. It's not about the high notes, folks-- it's about the tone quality. If you pick a key too low, you will sound dark and to put it bluntly, boring. If you pick a key too high, you will sound (and feel) vocally strained. If you pick just the right key, your voice will feel, sound and communicate so much better. 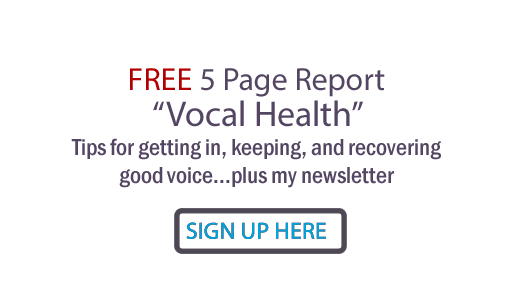 If you'd like to increase your vocal range, contact me at my website. Comments anyone? Hi Judy -- Just wanted to let you know I found this post to be very helpful. It will (I hope!) Allow me to approach my frustration with singing 'in key', with a new tool. Thank you thank you thank you - for the love of God and all that's decent, in the world, THANK YOU. You eloquently explained what I've been trying to explain to my lead guitar player FOREVER.